The food on our recent trip to Portland was stellar. I'm still drooling over it. But, food isn't everything. Right? It's actually the combination of food and experiences that make a trip fantastic. Good Food + Fun Times = Great Trip. Lucky for us, our PDX trip had both! We stayed at at AirBnB, which we decided it best if you're traveling with a baby/toddler/kid. You can a kitchen, get more space (multiple rooms, even), and more privacy (no worrying about the people next door hearing a crying baby at 2am). We loved our experience on our babymoon, and loved this experience as well. I think we're regular AirBnB-ers now. Our AirBnB was in a great location on Nob Hill and just a few blocks from NW 23rd Street, which has tons of restaurants and cute shops. This turned out very convenient on the first morning when it snowed. We just walked down the street for our coffee and donuts. I also managed to getaway during one of Caleb's naps to go through the shops. It felt so great to get out and just browse without worrying if Caleb was fussing. I think the AirBnB may have been Caleb's favorite part of the trip. We loved the stairs. If you set him down, he would immediately head to the stairs and banister. It was pretty hilarious. We thought the place was great. Josh thought it would make the perfect bachelor pad. HA! There was so much we wanted to do and such limited time. On the must list was revisiting the site of our engagement. Josh did the cutest proposal at Oblation Paper Press in the Pearl District. It was a walk down memory lane as we strolled the Pearl District and headed to Oblations. Sadly, the brunch place we ate at before he proposed is gone now as is the red couch in the store itself. But, it was fun to go back and relive our proposal day - such happy memories, such a happy day! Don't we look so young? And blond hair - haha. What's a trip to Portland without a visit to Powell's Books? We got lost in there the last time we visited, and then our cell phones didn't have any service so we wondered around trying to find each other for a good while. Luckily, we stayed together this time so no getting lost. We mostly checked out the children’s section. There were tons of children's books and we had a awesome time checking out the books. Caleb enjoyed some of the books as well, but mostly he enjoyed pushing his stroller through the aisles. We ended up getting the Opposites book and the Children’s Book of Virtues for Caleb's library collection. The lobby of the Ace Hotel is a great place for photos. As you can see from the Then & Now photos below, we've made this stop before...many years ago. We haven't changed much...right??!! We didn't spend much time downtown. We didn't even go to the main square where Nordstrom and stores are located. We walked by the food truck area, and the Ace Hotel on our way to Powell's and the Pearl District from our parking spot. I guess we'll have to spend more time downtown next visit (and get some shopping on - especially with the no sales tax!). As I mentioned above, we went to Oblations and Powell's which are both in the Pearl District. We have always enjoyed this area of Portland - trendy, hip, and cool buildings. We didn't spend much time going into shops or anything, but we did enjoy walking around a bit. If we had more time, we would have spend more time walking around and probably grabbing a bite to eat in this 'hood. But alas, time beckoned us to be quick (and so did Caleb's nap time). This was just a few blocks from our AirBnB. There are such cute shops along NW 23rd. I could have done a lot of damage if I let myself do some serious shopping. But I have restraint...a little. I did get a cute hat at Goorin Bros. We also grabbed some treats at The Meadow. This was also the street where Salt and Straw, Barista, and Blue Star Donuts was located. When we pulled up to the Waterfront it was practically hailing. Then, after about 10 minutes the sun came out. That's the Pacific Northwest for you. Josh likes to say, "if you don't like the weather, just wait 15 minutes." It's pretty true. Anyway, before grabbing dinner, we did a stroll along the waterfront. It was quick beautiful with the sun coming through just after the rain. There was even a rainbow! This is such a lovely place for a stroll in the early evenings. Pine Street Market is a relatively new addition to Portland - it just opened in the spring of 2016. Josh and I alway seem to find ourselves at these type of marketplaces. We love the concept, find the buildings they are in super cool (usually they are historic buildings), and think it's fun to see a few different restaurants of a city all in one space. Pine Street Market was originally a Carriage & Baggage Building that was used as a livery and horse-drawn carriage storage facility until the early 1900s (read more about it here), which we found interesting. Deciding where to eat was tough, but with the rainy day we opted for ramen. Afterwards we just had to buy some bread and pastries for later. Definitely a fun place to have a meal and check out. It worked especially well for bringing a noisy toddler to as well. Wow! This is a GREAT children's museum. 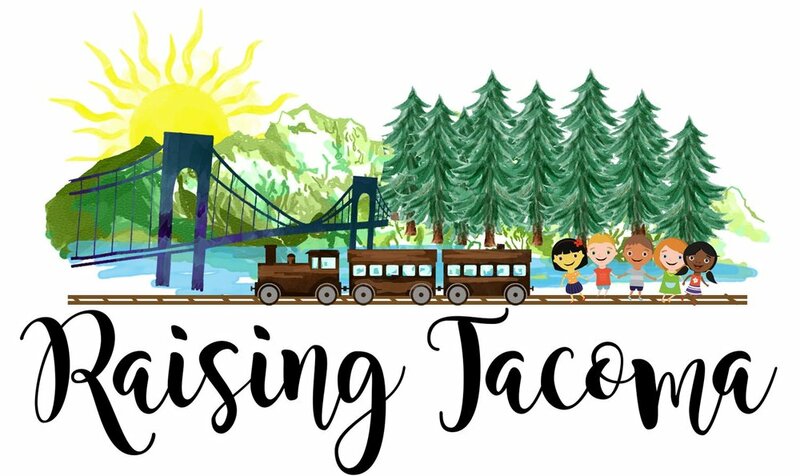 It's much bigger than the Children's Museum of Tacoma will all different rooms and activities. It was perfect for the rainy day, too. Caleb has a blast even though he did get bird poop on his head as we walked into the museum! I think his favorite activity was the mega bright lite board. He also enjoyed the grocery store, vet, construction site, and campsite. Oh, and there was a room with African instruments, and he learned to play the drums. Definitely a place to take your kiddo, and we will be back for sure! That was quite a lot to do in just a day and a half! We had tons of fun and are so glad we were able to get down to Portland for a quick, last-minute getaway.